Massage therapy continuing education requirements for license renewal vary from state to state and the laws are constantly changing. It's our current understanding that for license renewal Alaska requires massage therapists to complete 16 CE hours by September 30th of each odd-numbered year. You may take all of your CE hours through our home study programs. Because the Institute for Integrative Healthcare Studies is approved by the NCBTMB as a continuing education Approved Provider as well as through many other states, the Alaska Board of Massage will accept any of our 160+ courses to satisfy your license renewal requirements. If you would like to verify this information, or have further questions regarding your massage therapy continuing education requirements, we suggest contacting the Alaska Board of Massage directly. The telephone number for the Alaska Board is 907-465-3811 or visit their website at https://www.commerce.alaska.gov/web/cbpl/professionallicensing/boardofmassagetherapists.aspx. The Institute for Integrative Healthcare Studies is approved by the NCBTMB as a continuing education Approved Provider (#049478-00). All of our continuing education programs can be used for National Certification renewal. You may also use our credits for other organizations you may belong to, such as the American Massage Therapy Association (AMTA) or Associated Bodywork Massage Professionals (ABMP). Enroll Risk-Free! Examine our courses for up to 90 days and if you're not 100% satisfied by the quality or our service, your full tuition cost will be cheerfully refunded. Learn more about our guarantee. Fully online courses only What is this? Explore the various systems of the body while examining common conditions and illnesses so you can then more effectively help your clients. Program also available entirely online. This course offers a complete review of anatomy and physiology. Each chapter discusses one body system and contains information boxes with highlighted facts, precautions, and guidelines pertinent to bodyworkers. Learn about the basic anatomy of the body or use this program as a review and refresher of some of the most common areas for massage and bodywork. A comprehensive guide to all aspects of prenatal, labor and postpartum care. Learn how massage reduces anxiety and physical ailments, unlocks and frees tissue memories, eases panic disorders and can reduce postoperative pain. Based on four original Massage Professionals Update articles. This is an entirely online CE program. Course is available in both PDF and MP3 downloadable formats. Learn about how new Applied Kinesiology muscle testing and correction methods can benefit massage therapists and their clients. In this course, participants will learn basic aromatherapy skills, which will enable them to be educated consumers of aromatherapy products, create effective blends for specific purposes, and use essential oils and blends of essential oils safely. An introduction to the therapeutic properties of popular essential oils including best methods of purchasing and storing essential oils and precautions for use. Learn about the benefits of aromatherapy in pregnancy and how to use essential oils as well as safe and effective aromatherapy remedies for common conditions in mothers and babies. Combining Eastern and Western approaches, restore emotional and mental health through simple aromatherapeutic massage and acupressure techniques. Discover types of arthritic conditions, typical symptoms and how massage can assist in easing pain associated with arthritis through this course based on the original articles of the Massage Professionals Update. One of the oldest systems of health and healing in the world, learn how Ayurvedic massage helps balance the body and mind. Grow your practice with chair massage, bring massage into the workplace learn how to avoid injury with onsite massage. Based on four original Massage Professionals Update articles. Learn about basic business structures, preparing a simple business plan, legal requirements and record keeping, plus options to consider for your future in the profession of massage therapy. Through the original articles of the Massage Professionals Update, gain an understanding of the massage therapist's role regarding breast cancer and skin cancer as well as protocols for massage therapy. Explore the energetic dynamics between people and dogs including concepts behind a variety of massage practices, positional release techniques, acupressure, healing touch and chakra balancing. Deepen your understanding of pathology from a body/mind approach. Begin your introduction to chair massage and specific ethical issues related to chair massage. After completing this course, you will be able to complete a seated massage sequence in 15 minutes, and execute the transitions in the sequences smoothly and without hesitation. Earn credits through the Institute's Massage Professionals Update articles. Learn about categories of pain, regional pain syndrome and how massage therapists can affect the client. To study pain and its alleviation is to journey into the relationships between the body, mind and spirit. Get a quick review of the most essential points all massage therapists need to know to be more grounded, compassionate and effective in their work with people in chronic pain. Go beyond relaxation massage, expand your skills and integrate your knowledge of anatomy with therapeutic massage. Developed in 1989 by Mary Kathleen Rose through her work with hospice patients, the modality of Comfort Touch® enables you to bring the benefits of massage to the elderly and individuals suffering from chronic illness or injury. Learn how massage can affect specific pathologies and client complaints including recognizing alopecia areata, techniques for alleviating constipation, TCM meridians for eye health, peripheral arterial disease, ganglion cysts, vital steps to working on clients with cancer, safety concerns for clients with diabetes and how alcohol effects massage and bodywork. Identify the causes of and how to address Achilles tendonitis, shin splints and iliotibial band syndrome as well as how massage can improve athletic performance through this CE program based on original articles from the Massage Professionals Update. Two course package that covers communicable diseases - Hepatitis and HIV/AIDS. Examine the "how and why" of massage and bodywork communication, documentation, insurance billing and ethics. With Cranial-Sacral Therapy techniques, a trained practitioner can balance the rhythm of the cerebral-spinal pulse and treat numerous ailments. Closed captioning available with online video. Introduce yourself to the history of cupping, theory, cautions and contraindications as well as some cupping variations through this course developed from original Massage Professionals Update articles. Examine over 30 different disorders and common sports injuries from a Traditional Chinese Medicine (TCM) perspective and discuss the role of cupping in treating each condition. This advanced course examines important terminology and techniques concerning musculoskeletal fitness and dysfunction. Learn how to recognize the symptoms and risk factors associated with Deep Vein Thrombosis and to distinguish a muscular problem from a more dangerous scenario. Launching and growing a successful solo or group practice can be a daunting task, unless you have a guide to help you actualize your vision. Discover ways to assist clients with irritable bowel syndrome (IBS), relieving heartburn symptoms, common digestive ailments and ways to stimulate the triple burner meridian which metabolizes the fluids of the body through this course based on original articles from the Massage Professionals Update. The makeup of the United States is ever expanding, as such one must become more aware of the differences in the clients we serve in order to provide the best care. This course will assist you in your learning continuum of cultural sensitivity to competence. Bringing together evidence from a range of disciplines to provide an explanation for the energetic exchanges that take place in all therapies to help you understand and communicate the energetic effects of your work as a massage therapist. This course presents equine anatomy and physiology, assessment strategies, safety issues for both the horse and the therapist, equine massage theory and more. Earn credits through the Institute's Massage Professionals Update articles. Learn tips for maintaining essential oils, choosing oils for digestive ailments, essential oils for reducing sciatica as well as effective treatments for head lice. Clear and easy-to-use information to assist in all realms of insurance billing, documentation and communication for prescribed manual therapy. Also includes fundamental information on HIPAA regulations. There is one thing that stands between a person and success–it is connection. This course will show you how anyone can learn how to make every communication an opportunity for a powerful connection. In Beyond Religion, the Dalai Lama proposes the development of a secular system of ethics that transcends religion and focuses on our shared humanity and our interdependence as a key part of that humanity. His Holiness discusses the importance of global tolerance and rejection of violence, as well as the need for morality to be included in education. This is a 1-hour ethics refresher course for practitioners who need to quickly review the basics related to NCBTMB Standard V: Roles and Boundaries. This course presents a moral system of ethics for your consideration including universal principles of compassion for oneself and others and restraint from causing harm. This short course gives massage therapists and bodyworkers an opportunity to reflect on their own professionalism and several important ethical considerations that relate to the health professions. Reflect on your professionalism while reviewing several ethical issues within the massage therapy and bodywork profession. Examine key legal and ethical concepts related to massage and bodywork including professional roles and boundaries in the health field. Address the challenges involved in caring for people who are ill, injured or dying. A concise review of all nine parts of the NCBTMB's Standard V: Professional Roles and Boundaries in the NCBTMB Standards of Practice. This program provides an overview of professionalism and scope of practice for massage therapists from the legal, educational, competency and self-accountability standpoints. Recognize "red flags" that can indicate ethical decision points. Learn how to create a safe and consistent therapeutic environment and minimize problems related to client transference. This course reviews NCBTMB Standard I: Professionalism and Standard V: Roles and Boundaries in detail and helps you consider how they relate to your practice. This is a short, concise review of the main legal and ethical concepts related to professional roles and boundaries in massage and bodywork today. Expand your understanding of ethics. Learn how to build a safer therapeutic environment for yourself and your client. Provides a structure for ethical decision-making that will serve your clients, yourself, your profession and your community. Learn a universal ethical framework that addresses massage therapy-specific ethics and real-life business advice. Movement patterns and structural imbalances may develop before birth and during early childhood. Learn how to read structural imbalances and variations in the body and address fascial imbalances through bodywork. This program is designed to provide the massage therapist with a thorough understanding of this highly variable syndrome in order to provide the best care possible to his/her clients. For convenience and savings, you can enroll in our set of three courses required by the Florida Board of Massage for license renewal. Includes Ethics: Therapeutic Relationships, Law & Legal Issues (Florida), and Medical Errors. Programs also available entirely online. You have a choice with our second set of three courses required by the Florida Board of Massage for license renewal. Includes Ethics: Practice Management, Law & Legal Issues (Florida), and Medical Errors. Set 3 includes three courses required by the Florida Board of Massage for license renewal - Ethics: Professional Conduct, Preventing Medical Errors, and Law & Legal Issues (Florida). Set 4 includes three courses required by the Florida Board of Massage for license renewal - Ethics: Therapeutic Environment, Preventing Medical Errors, and Law & Legal Issues (Florida). Set 5 includes three courses required by the Florida Board of Massage for license renewal - Ethics: NCBTMB Standard V, Medical Errors, and Law & Legal Issues (Florida). Set 6 includes three courses required by the Florida Board of Massage for license renewal - Ethics: Roles and Boundaries, Medical Errors, and Law & Legal Issues (Florida). Earn credits through the Institute's Massage Professionals Update articles. Based on four original articles, recognize how to address heel spurs, techniques for plantar fasciitis, easing discomfort of Morton's Toe through massage, as well as how to detect plantar warts. Save your hands and wrists and provide greater benefits to your clients with less effort by learning how to use your forearms as your primary massage tool. Based on original articles from the Massage Professionals Update, learn 8 common medical issues and their massage implications for geriatric clients, effective techniques and 5 precautions for frail elders, how to identify the early stages of a stroke, and how massage can be used for stroke rehabilitation. By demonstrating how going green can fit any budget, this program shows that good environmental and financial decisions go hand-in-hand. Headaches are extremely common and nearly everyone has had this type of pain on occasion. In some cases the pain is more frequent and debilitating. Discover ways to assist your clients with recurring headaches. Energy work can be a natural adjunct to massage. With massage, manual therapists can affect their client's energy field, and with training and experience they can also balance the energy field. Identify ways to prevent burnout, how to apply healthy boundaries with clients, important outcall safety issues, tips for improving both your mind/body as well as your clients' and more. HIV infected persons are seeking healing modalities that enhance the physical, psychological and spiritual aspects of their being. Provide your massage skills with greater awareness and sensitivity for people who have HIV infection. This ground-breaking program contributes a depth of wisdom and education that supports anyone working with the seriously ill or the dying. Based on four original MPU articles, learn about hypertension and how it is impacted by bodywork and whether hypertension is an indication or contraindication for massage, as well as how massage can affect cholesterol levels and the impact of statins on massage. Learn the benefits and key principles of massage for infants and children including easing discomfort and releasing tension in normal and premature infants, asthmatic children, and children with special needs. Discover how antibiotics may impact bodywork, staph infection concerns for massage therapists, proper hand cleansing procedures, as well as situations that may require medical gloves in this CE course based on original articles from the Massage Professionals Update. With over 6 million Americans infected with one or more forms of viral hepatitis, practitioners must understand the impact this growing problem has on both their clients and their practice. This course also covers information with regard to universal precautions for healthcare workers and implications for the massage therapist. Integrate traditional Chinese medicine and standard Western reflexology practice. This course describes meridians essential for reflexology, the use of meridian therapy and the 5 elements for effective assessment and treatment, relating structural foot problems to imbalances in the rest of the body and much more. 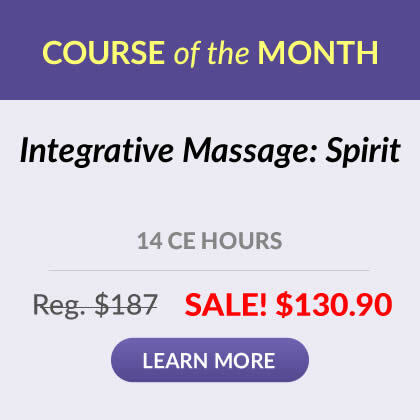 Learn all three Integrative Massage routines - Earth, Fire, Spirit - and begin creating your own Integrative approach to therapy. Using the side posture primarily, the Earth Massage routine employs deep, compressive techniques that soften adhesions and muscle fibrosis, reducing the activity of myofascial trigger points, increasing the mobility of connective tissue and joints, and improving posture. The Fire Massage routine presented in the video integrates massage techniques from Sports Massage, Active Resistance Stretching, Neurolymphatic Reflex Massage, Breath Work, Deep Tissue Therapy and Swedish Massage. The Spirit Massage is designed to quiet the mind and to get the receiver in touch with their own inner healing rhythms. Through text, photos, case studies and sample forms, explore a chair massage expert's recommendations for equipment, communication, documentation and body mechanics. For every massage or bodywork practitioner who wants to be more knowledgeable about giving massage to well, premature and special needs infants. In this course, you are presented with a detailed view of the laws and rules of the Florida Board of Massage Therapy and how they apply to the massage therapy business. Review four tactics that prolong back pain relief, how clients can prevent low back pain, ways Neuromuscular Therapy can assist in relieving lumbar spasms, as well as postural evaluations through this course based on original articles from the Massage Professionals Update. Text is also available in MP3 format for download. Lymph drainage massage can be extremely beneficial to clients who suffer from allergies, have had recent surgery, or suffer from edema. Learn how to continue to thrive during tough economic times with suggestions for improving profits through this short course based on the Massage Professionals Update original articles. Discover easy, affordable ways to communicate your unique message to your ideal clients, using the four organizing steps described in this course. Specially priced bundle of required courses for your Maryland Board of Massage for license renewal. Includes Diversity: Cultural Competence, Ethics: Professional Conduct, and HIV Update for Professionals. For convenience and savings, we've bundled all of the Maryland required courses for you. This package includes Diversity: Cultural Competence, Ethics: Therapeutic Relationships, and HIV Update for Professionals. Another option for completing all of your Maryland required courses. This package includes Diversity: Cultural Competence, Ethics: Therapeutic Environment, Infectious Disease: HIV/AIDS and Infectious Disease: Hepatitis. Earn credits through the Institute's Massage Professionals Update articles. Based on four original articles, get suggestions on expanding your practice, basics on offering retail products and learn key components of soft selling techniques. Learn the concepts underlying massage and bodywork for clients who have edema, including an overview of lymph drainage and important steps to preventing lymphedema. Discover how you can assist clients in alleviating frequent headaches and neck pain through video and text with authors Sandy Fritz and Leon Chaitow. Responsible for over 90% of all reported backaches, "non-specific" backache has no actual associated pathology. Discover the evolution of "non-specific" backache as well as assessment and treatment methods ideal for use in combination with massage therapy derived from physical therapy, osteopathic and chiropractic sources. Take each course when it fits your needs. You may take some courses now and save the other courses for your next renewal period if you wish. Expand your knowledge of chair massage by learning practical and useful information to design, implement and maintain a successful chair massage business or to complement an existing practice. Leslie Stager, RN, LMT will be your guide as you learn about the benefits of massage therapy during pregnancy, many hands-on techniques for addressing specific complaints, proper draping, and cautions and contraindications. Learn the ancient art of Thai Massage with master Richard Gold through the Mastering Thai Massage program. This course is designed to give a brief overview of medical errors and how they affect massage therapists. Learn how to eliminate pain and restore motion by applying sustained pressure into myofascial restrictions. It is common for nerve problems to coexist with myofascial tension and pain. Learn the anatomy of the nerves and numerous tests and techniques designed to free restrictions along the nerve path and normalize tissue function. Earn CE through the Institute's Massage Professionals Update original articles and learn the benefits of bodywork for epileptic clients, tools to help people with dementia, benefits of massage on Parkinson's Disease, as well as the value of touch therapy for autistic clients. Based on the work of Drs. Janet Travell and Raymond Nimmo, these techniques are appropriate for medical massage as well as sports massage applications. Busting the myth that massage is prohibited for those with cancer, this detailed and informative course presents solid conceptual guidelines about safe, beneficial touch for cancer patients. Energize your practice and take it to a new level by following the suggestions in this course. The Orthopedic Assessment program will walk you through a logical progression of testing that will reveal underlying pathologies with crystal clarity. Learn important evidence-based approaches to safe, effective and cost-effective orthopedic massage. Learn key concepts about how to recognize and confidently respond to soft tissue and movement therapy indications, precautions and contraindications related to the digestive and endocrine systems. How does your client's medication affect your treatment plan? Learn the cautions, contraindications, effects of massage therapy and appropriate strokes to use based on the medications your client has been prescribed. Add knowledge of the powerful energy healing modality, Polarity Therapy, to your practice. In this course, you will learn the three currents of energy, the three modes of touch and the techniques for balancing the flow of the body's energy currents in various areas of the body. Explore the core concepts of positional release techniques for muscle and joint problems through this advanced continuing education course. Understand the symptoms of PTSD, the importance of the therapeutic relationship with clients suffering from PTSD, how aromatherapy complements massage for trauma, as well as how to help clients trust your touch. This program is based on original articles posted in the Massage Professionals Update newsletter. Are you aching from using your upper body more than you should (and using your lower body less than you should)? In "Pour, Don't Push," you will learn how to use your breath and body weight as your primary tools so you can work more effectively and with greater ease. This unique massage continuing education course will help you replace boredom and burnout with love for your work again. You'll be a happier and more effective massage therapist. Build a comprehensive foundation to safely and effectively support mothers in pregnancy and childbirth. Earn credits through the Institute's Massage Professionals Update articles. Learn how to differentiate between a caution and contraindication when working with high-risk, pregnant clients, assist clients in helping colicky infants, how myofascial release can improve many childhood problems, and discover how massage can help aggressive children. Learn why medical errors contribute to high health-care costs and why it's so important to design your work to increase safety for your clients and yourself. 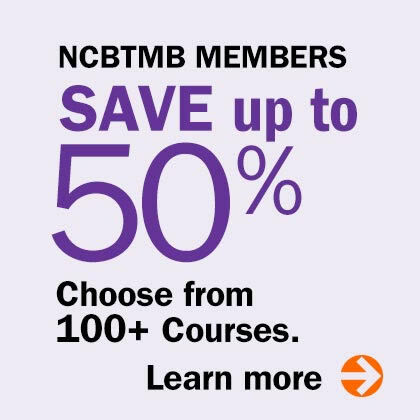 Two course package that provides all you need to fulfill your NCBTMB ethics requirement. Learn new insights into the psychological factors that influence your work and your client relations. Learn dynamic new ways to create individualized massage approaches for each client by exploring the amazing connections between the mind and body and how these connections influence the body's shape and the person's responses. Explore the amazing connections between the body and mind and learn how these connections influence a person's responses to life, including how they respond to massage therapy and bodywork. Gain a better understanding of the emotional component of your work and facilitate longer-lasting positive results with the science of Psychoneuroimmunology. An integrated mind-body healing method, integrate qigong into your life and massage or bodywork practice. Instructor Laura Norman teaches us that reflexology involves the gentle and skillful stimulation of the nervous, vascular and lymphatic systems, as well as the subtle energy currents within the body. These actions can reduce pain, improve circulation, bolster immunity and provide a sense of balance, relaxation, and well-being. Earn credits through the Institute's Massage Professionals Update articles. Based on four original articles, review the history and origin of Reiki, various Reiki hand positions, discover how Reiki can be used in a hospital setting and its ability in reducing the effects of physical and psychological trauma. Research is scary for many of us. We are unsure of how to begin, where to go for information and what qualifies as a 'good' source. We may not fully understand the different types of research or how to go about formulating a research question, never mind designing a research study. This course will give you the basics in terminology and an overview of concepts and theories behind the subject of research. Based on both the theory of acupuncture energetics originating from Chinese medicine and massage techniques of Japanese origin, Shiatsu Anma Therapy addresses illnesses and painful conditions in the body stemming from blockages in the flow of energy, or chi, within the acupressure meridian, or channel system. Discover side lying techniques useful for any client who may be unable to lie comfortably in prone or supine position. Learn how to integrative side lying massage into your traditional massage techniques providing the best access to shoulder, neck, low back and hip areas. Based on four original Massage Professionals Update articles, learn techniques for removing scar tissue, how to properly identify rashes, avoiding dry skin from frequent hand washing, as well as massage for sunburn healing. Discover the impact genital herpes has on a massage therapy practice, how massage can help as a preventative therapy to Shingles, if massage therapy is safe for clients with cellulitis and precautions for poison ivy. This course is based on Massage Professionals Update's original articles. Through this CE course based on original MPU articles, learn about the benefits and challenges of working in a spa, how to integrate spa services into your practice, the impact color has in your massage office, as well as increasing business through at-home spa parties. The core study materials in this program are a thorough 125-minute video with a corresponding photographic manual, both presented by renowned instructor James Mally, ND. Take care of yourself naturally. Learn easy, effective ways to support and strengthen your immune system through nutrition, dietary supplements, herbs and lifestyle choices. You will learn a complete, basic hot stone massage, a cool moonstone facial massage and six advanced restorative protocols covering a variety of dysfunctions. Deepen your understanding of how to reduce chronic stress including how to manage your own stress and how to communicate the ways your services help your clients experience stress relief. Explore the core concepts of standing and moving posture assessment as well as functional wellness, structural integration, musculoskeletal imbalances, Feldenkrais and Rolfing. Whether you are just starting a business of your own or have been in business for a number of years, Successful Business Management will cover all you need to know from launching a business to handling finances as well as implementing or improving already existing policies and procedures. In this program, James Mally, ND, LMT explains and demonstrates over 90 different Swedish massage techniques to help you enhance your skills. An introduction to teaching practices for 8 forms of multiple intelligences. Expand your professional repertoire through teaching prenatal massage to expectant couples. As a bodyworker teaching partner massage, you can affect the well-being and health of not just the mother, but the unborn child, and help strengthen the family bonds at the same time. Discover how Thai Yoga Massage promotes physical, mental and spiritual well-being. Discover how you can begin assisting those clients diagnosed with fibromyalgia. Learn how psychoneuroimmunology (PNI) validates the mind/body link so you can better support your clients and help them facilitate positive changes that last over time. Develop skills as a shiatsu practitioner through this video and text based program providing comprehensive coverage of all shiatsu essentials. Examine the value of touch from sociological, anthropological and physiological perspectives and why massage is such a significant therapy for various conditions. Clearly define the core principles necessary for deep tissue massage and present safe, sensitive and efficient approaches to postural analysis, treatment and exercise. Delve into the complex issues of soft tissue restrictions, osseous articulations and strategies for working with the multitude of different issues we face as therapists. How is it possible that "business" ethics doesn't exist? In the course text, There's No Such Thing As "Business" Ethics, respected leadership expert, speaker, and author, John C. Maxwell, demonstrates there is but one single standard of ethics – the Golden Rule. This course package presents research results on touch therapies and emphasizes the need for change in societal attitudes. A depth of experience and sensitivity for working with the seriously ill. Explore trigger point therapy, a proven approach for the relief of soft-tissue pain and dysfunction. A goldmine of practical information and research about fibromyalgia syndrome and chronic myofascial pain, examine how these conditions can affect your client's quality of life as well as important concepts about safe and effective ways to maintain health while decreasing pain and dysfunction. Deepen your understanding of HIV and encourage respectful and compassionate skills for working with people who have HIV infection. Explore the fundamental theory and practical basis for using sports massage to keep athletes in top shape, recover from injuries, and improve performance. Do you know how to guard yourself and your clients from infectious diseases? Learn how in this short and clear course. Examine the results of current massage therapy-related research and apply the results to your practice. Earn credits through the Institute's Massage Professionals Update articles. Based on four popular original articles, broaden your understanding of how you can assist your female clients through the various stages in a woman's life. Want to receive the latest massage news, our "Readers' Favorite" articles, and great CE offers? Plus Our FREE REPORT 6 Secrets to Attract and Retain More Clients. It’s easy. Join our FREE INDUSTRY LEADING newsletter below and you'll receive the latest massage news, articles you'll love and offers you’ll use! We respect your privacy and will never sell your email address to anyone. Your download should have begun. If it does not after a few seconds, click here to download. Cannot be combined with Course of the Month or already reduced prices. Not valid on prior enrollments or other offers. Code 25OFFCE is a LIMITED TIME OFFER.